Because I replaced it with a flower arranging station. 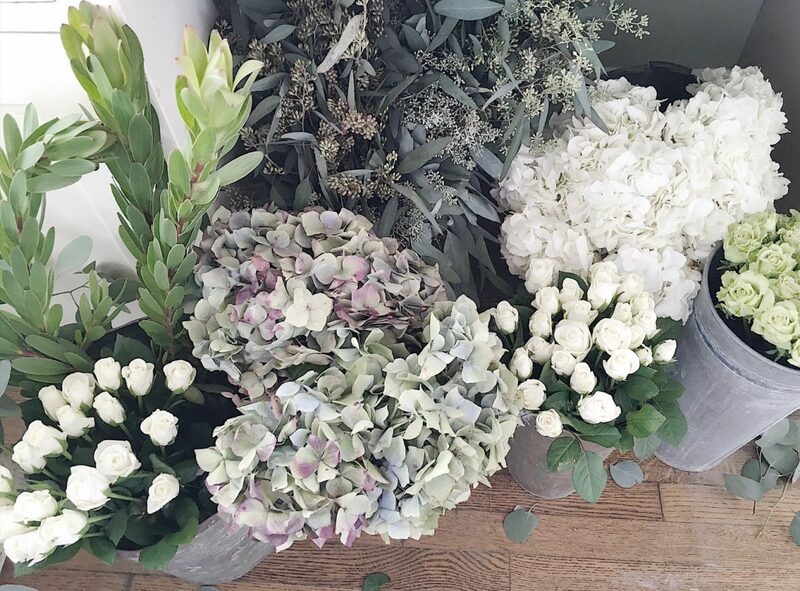 In my house, it’s all about flower arrangements. Before you think I am crazy, let me explain. Also, my husband rarely drinks coffee, so I don’t want to make a full pot. I don’t own a Keurig machine because I like to make a large cup of coffee and my mug won’t fit under the spout. So here is what I do every morning to make coffee. I grab a Rae Dunn mug (based on my mood of the morning), open up one Starbuck’s Via Instant coffee packet and add hot water from my instant-hot faucet. The total time to do this takes less than a minute. So why did I need an entire coffee station to make a cup of coffee in less than a minute? Hence, my brilliant idea for my flower arranging station. I love flowers. And as Monet said, “I must have flowers always and always”. But the “arranging the flowers“ part has never been my favorite thing to do because of how it always disrupts my kitchen. So I now have the perfect place to arrange my flowers. 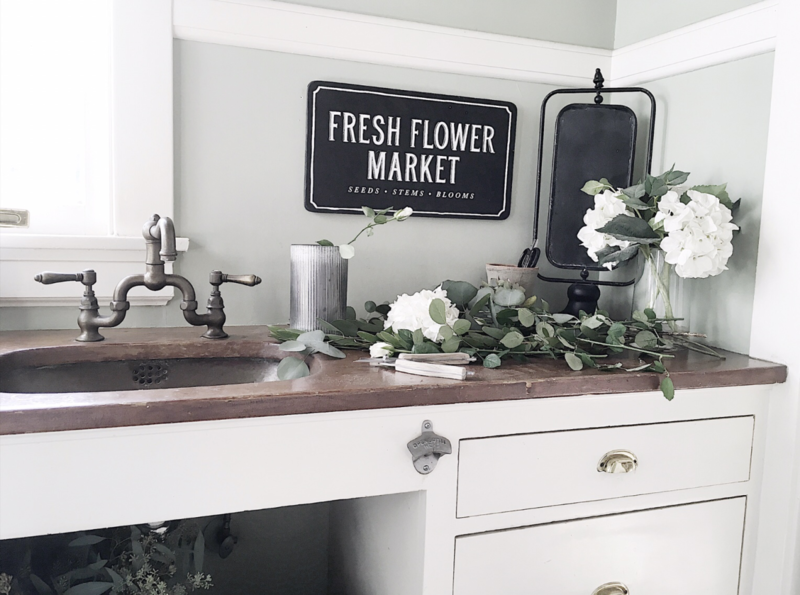 I have a large countertop with a hundred-year-old working sink, with all of my vases, pots, and tools nearby. I was so excited about this that I sort of renamed half of my Butler’s Pantry to the Flower Arranging Room. 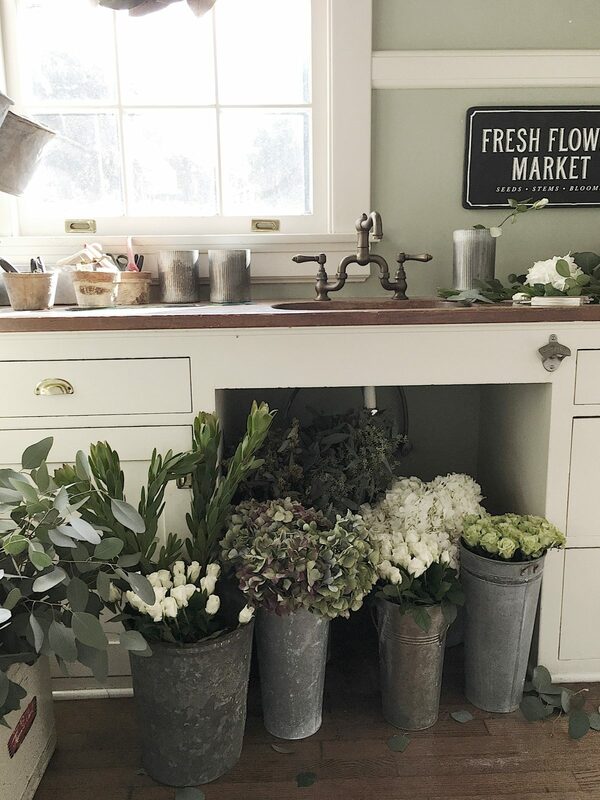 And I am still trying to do a bi-monthly blog post on making flower arrangements for my home! This was so perfect for me. 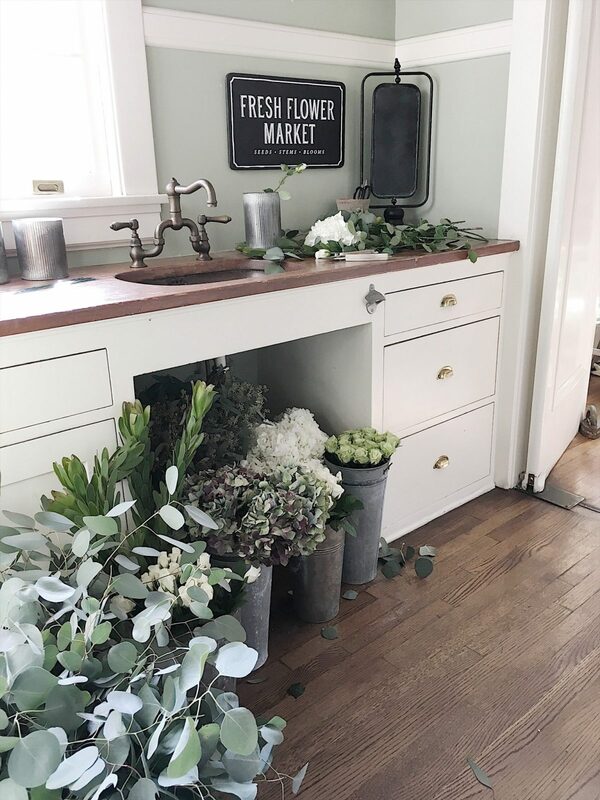 Because I knew I would spend more than a minute in the room formerly known as my Butler’s Pantry to play with flowers every day. Even if occasionally I am even creating faux arrangements. My only dilemma is what to do when I get the copper latte machine fixed. 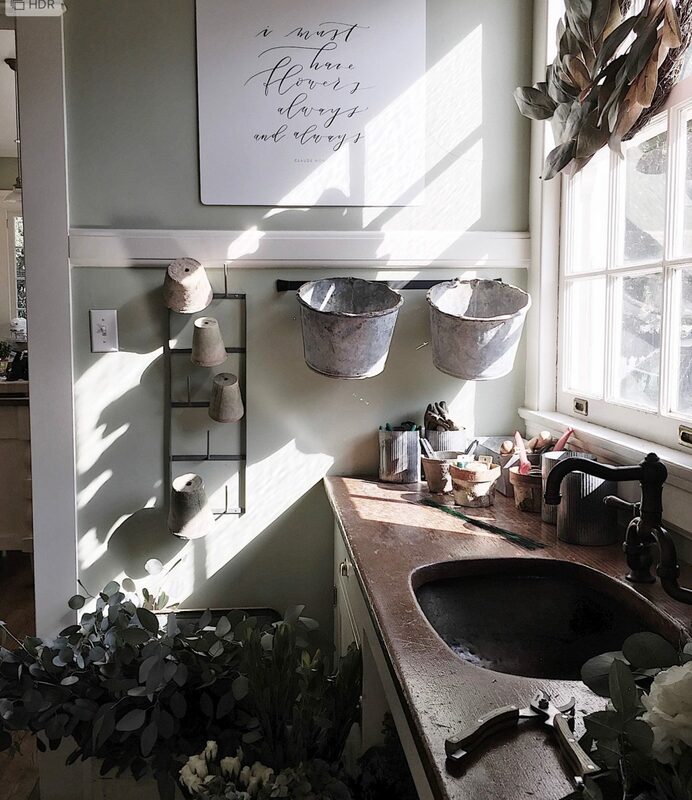 It’s too gorgeous not to have a nice spot in our home. I just need to figure that out. Because it’s been a year and I haven’t gotten it fixed yet. Until then, I must have flowers and flowers. So do you think I am crazy? No I think that’s a brilliant idea!! How cool to make good use of that unused space. Random question…are those red oak floors? Do you recall the stain? I have similar/sane floors but they are orange and blahand looking to restain them. Love your color! So beautiful Leslie! Have fun! I love a good coffee bar, but I have to say that I love this idea! Looks beautiful, Leslie! Darlin it’s your home and if that works best for you then that’s what’s best for you! It’s lovely!! They are not red oak. And I am so sorry I don’t know the satin. I would guess a medium brown perhaps? Oops! I meant to type “stain”! At one of my first openings (I am a pastel artist) a very distinguished gentleman and his male friend were leaving the opening and he said “Finally, someone has created art for the butler’s pantry!” I took it as a compliment. This is beautiful, I’d love to do flower arrangements in there. I’m looking into doing that on one side of laundry room. Old Formica out! 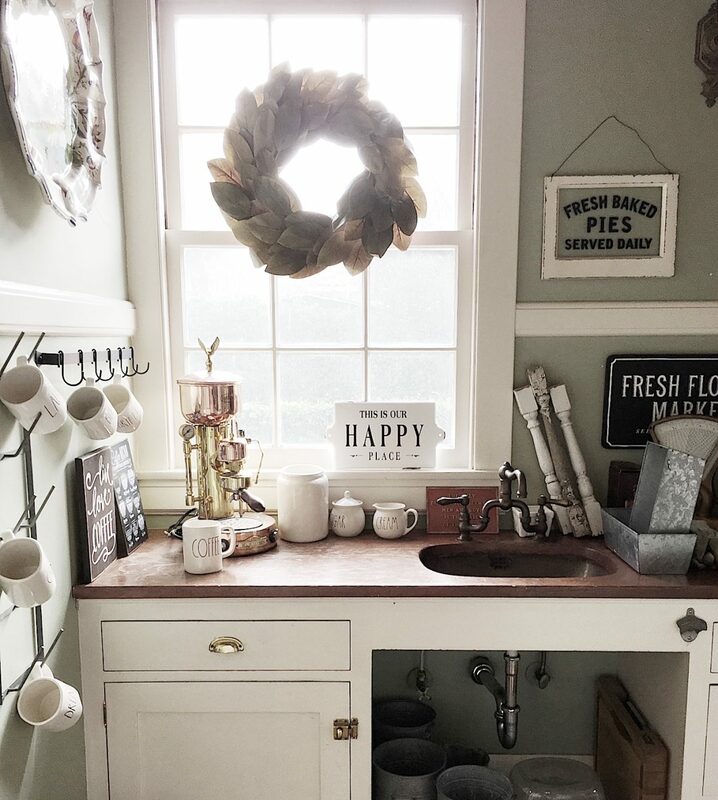 I do love your flower arranging room, but I can’t do w/o my Keurig…so much so, when searching for a vacation home to go skiing last year, I asked if they had a Keurig. The base of the Keurig slides out for taller mugs. We use the 20 & 30 oz Yeti mugs for our coffee, both fit perfectly in the Keurig! I think its genius! I’m the only one who drinks coffee in my house and A Keurig portion is never big enough for me. Even when Id make a pot of coffee even with around starbucks beans it was never as good as Starbucks. I started buying packs of Via in Costco and it was delicio0us! I always have one in my purse and travel with them too. If you can figure out how to make an insert to drop into the sink, it can be a gift wrapping station too!